❤ERGONOMIC DESIGN- EASY TO USE: The Ingrown toenail file is separately designed with one straight end and one curved end to meet different demand. 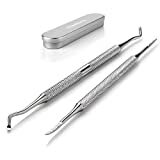 the cured radian design , joint the nail and can enter into nail to file away and shine ingrown edges or thick part which dig into the nail, and ingrown toenail lifter is designed with cured little spoons to grab debris or dirty inside nails . ❤USE STEP : Firstly, use FAMILIFE Ingrown Nail Lifter to grab debris or dirty inside the nail , then use FAMILIFE L03 Ingrown Toenail Clipper to clip the nail . Finally, using the ingrown nail file to file away and shine ingrown edges or thick part which dig into the nail . ❤How to Maintain: It is better to wipe this ingrown toenail tools with alcohol after using , wipe them dried and put them into our box . it also come with a storage box for you to store , do you think it is very convenient and healthy ? ❤LIFETIME GUARANTEE -FAMILIFE'S PROMISE:All products of FAMILIFE BRAND are protected by FAMILIFE , FAMILIFE can offer you HIGH QUALITY products with so favorable price and best service 100% Satisfaction Guarantee and a Lifetime Replacement . We will either refund your money or redeliver a new product if you are not satisfied with ingrown toenail tools for any reason. Hassle-free. You are worth it!